(ISN) – WINNIPEG – The No. 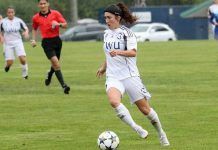 5 Trinity Western Spartans made it four straight wins as they defeated the University of Winnipeg Wesmen 3-0 Friday night in Winnipeg. Fifth year middle Alicia Perrin (Creston, B.C.) with nine kills, five blocks and three digs and third year outside hitter Sophie Carpentier (Ottawa) with 10 kills, seven digs and three aces led the Spartans to a convincing 25-20, 25-10, 25-18 win. The victory improves TWU to 18-5, good enough for top spot in Canada West, while the loss drops the Wesmen to 8-15. The Spartans defence was the difference in tonight’s match as they held the Wesmen to a negative 11.8 hitting percentage, while only finding the TWU side of the floor for 16 kills. The Spartans finished the night with 10 blocks, and 40 digs to go with their 33 kills. Carly Hamilton (Calgary) was also strong for TWU as the fifth year outside hitter finished with five kills, nine digs, five blocks and three aces. Second year setter Nikki Cornwall (Coquitlam, B.C.) led the TWU attack with 23 digs. Libero Kristen Moncks (Standard, Alta.) also had a quality outing as she earned nine digs. Alexandra Rose with six kills and five digs and Tia Boroski with four kills and six digs led the Wesmen. Ellina Domnidou finished the night with eight assists for Winnipeg. The two teams will finish of the Canada West regular season tomorrow afternoon in Winnipeg with match time set for 11 a.m. PST.